When we leaned that the P&N Tools were not going to be manufactured anymore, we bought their remaining stock. These tools are made fo M2 high speed steel and represent a great value for the woodturner. All tools are unhandled. Patience & Nicholson have been manufacturing turning tools in Australia for over 20 years. Over that time they have built a reputation for producing consistent high quality woodturning tools. Michael Hosaluk, a professional turner from Canada, has been using them with his handle system since 1992, and highly recommends them to his students. 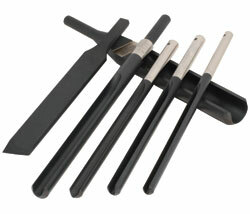 All of the P & N Tools are made of M2 high speed steel with a black steam oxide finish. They are hardened to between 60 and 63 HRC and will hold a very sharp edge. All the tools are supplied unhandled. Each tool is made with a 3/8" or 1/2" shank which makes them perfect for use in the Hosaluk or other tool handles. They can also be fitted with a custom made or pre-turned wooden handle.